UX For Dummies is a hands-on guide to developing and implementing user experience strategy. Written by globally-recognized UX consultants, this essential resource provides expert insight and guidance on using the tools and techniques that create a great user experience, along with practical advice on implementing a UX strategy that aligns with your organisation's business goals and philosophy. You'll learn how to integrate web design, user research, business planning and data analysis to focus your company's web presence on the needs of your customers, gaining the skills you need to be effective in the field of user experience design. Whether it's the interface, graphics, industrial design, physical interaction or a user manual, being anything less than on point can negatively affect customer satisfaction and retention. User experience design fully encompasses traditional human-computer interaction design, and extends it to address all aspects of a product or service as perceived by users. 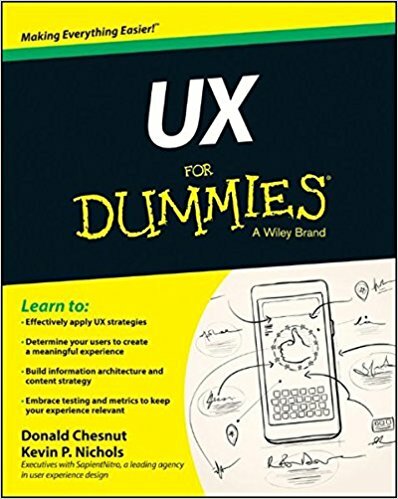 UX For Dummies provides comprehensive guidance to professionals looking to understand and apply effective UX strategies. The UX field is growing rapidly as companies realise that meeting your business goals requires a web presence aligned with customer needs. This alignment demands smart strategy and even smarter design. Consultants, designers and practitioners must all be on board if the result is to be cohesive and effective. UX For Dummies provides the information and expert advice you need to get up to speed quickly.